Bwindi Impenetrable National Park covers 331 square kilometers of floristically diverse tropical rainforest. Fauna-wise it’s most notable for its ca. 400 mountain gorillas, almost half the world's population of this critically endangered species. The park is located in southwestern Uganda in the Afromontane biogeographic area at an altitudinal range of 1,190-2,607m. It is accessible only on foot. There are 4 ‘tourism sectors’ from which the park and the gorillas can be accessed: Buhoma, Ruhija, Rushaga and Nkuringo. Bwindi Impenetrable National Park has been made a WHS for its high variety of tree and fern species, whose dense cover of the valley floors has lead to the name ‘impenetrable’. It is the remnant of what once was a very large forest. To the general public the park is mostly known as the number 1 place to see mountain gorillas. Bwindi welcomes over 20,000 visitors a year for that purpose. Although the southern part of Bwindi lies only some 50km north of Mgahinga NP and the Virunga Massif, it is a separate mountain range. Both nature reserves were once connected via a corridor, but they got separated some 500 years ago. The mountain gorillas in Bwindi have evolved on their own since, that’s why they’re sometimes regarded as a different subspecies from the Virungan ones. According to research, they are more likely to feed on fruits, travel longer distances per day and build their nest in trees than their Virungan cousins. As this was my second gorilla tracking after Virunga 5 days before, it is tempting to compare the two experiences. In hindsight I am happy that I choose to put two gorilla visits in my schedule. Actually quite a lot of people do so, often combining Rwanda and Uganda. My two visits complemented each other well: the gorillas in Virunga were extremely calm, just sitting around for 45 minutes so it was easy to take good photos and observe their enormous bodies. The gorillas in Bwindi were very active: climbing trees, tumbling down from the hillside, breaking a tree with bare hands and delivering a mock charge to clear the path from park staff that were in their way. The experience in Bwindi was a bit more touristy also. There are porters available here from the village that earn their money by carrying your bag & pulling/pushing you whenever needed - not a bad idea as, according to the Bradt Travel Guide, Nkuringo trailhead is “the most physically challenging of all gorilla tracking locations”. It essentially comes down to walking from the ridge to the valley floor, and back up again. At the end you will receive a gorilla certificate to proof that you made it. I had booked my gorilla permit to the Nkuringo family 9 months before, as they’re said to sell out quickly. However there were only 5 people in our group for the day (there’s a maximum of 8) and one guy even booked only a day in advance. The Nkuringo are one of 12 visitable groups in Bwindi. They became habituated in 2004 after they had been so naughty to destroy crops. Nowadays a buffer zone between them and the local farms has been created via the introduction of tea plantations. This provides some extra jobs for the community, and the gorillas don’t venture in there as they don’t like the taste of it (in the past gorillas have learned to eat corn, a quite recent addition to the African food chain). Just as in Virunga, the gorillas were easy to find (after a 1.5 hour scramble down from the steep hill). Bwindi lives up to its ‘impenetrable’ nickname as it doesn’t give away its inner treasures easily: I haven’t entered it for more than 10 metres as the gorillas were close to forest edge. I stayed for 3 nights at the Nkuringo Gorilla Camp, a friendly and cosy lodge with good food. Besides gorilla tracking, there’s no other option to get into the park from there. I filled part of my second day here with some birding and ‘chameleon tracking’ on the roads surrounding Nkuringo village. From another trailhead, Ruhija, it is possible to do a trek deeper into the park to the Mubwindi Swamp. Those who want to see Gorillas in the wild have relatively few choices. In Central Africa, Gabon is a possibility but, in 2001 after 2 days hard tracking there, we had only heard the creatures – they are not well “habituated”. Congo Brazzaville sounds to have some wonderful areas but is dangerous/unhealthy (Ebola?). The Democratic Republic of the Congo (DRC) is, as of Sept 2006 (when this review was written), still not really safe for travel outside Goma. Which leaves Rwanda and Uganda. Rwanda is well back in business and from our experience is the better place to go for anyone just wanting to see Gorillas - it has 7 habituated groups and most of these are usually easy to reach (but the cost is $375 per visit rising in 2007 to $500). However its Gorilla location is somewhat illogically not a UNESCO site - really the neighbouring Gorilla areas within the "Virungas" in all 3 countries (DRC, Uganda and Rwanda) should compromise a single WHS - the Rwanda gorilla sites are just a few kms from the boundary of the Virunga park in DRC. In Uganda all recent reports suggest that sightings are to all intents and purposes unachievable now at Mgahinga Gorilla Park. 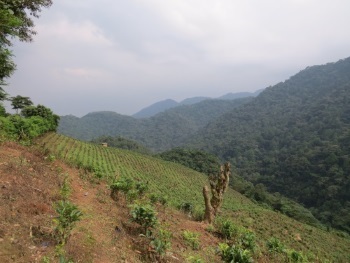 Which just leaves Bwindi – which also has the unique advantage of also being a WHS! We visited it way back in summer 1995 - in 1999 the camp we stayed at was to be the site of terrorist attack which resulted in the deaths of 8 tourists. From the UK we booked 2 permits through a local travel company from whom we also rented a Toyota Landcruiser and driver for the duration of our tour of Uganda. I won’t “recommend” the company by naming it – it generally did what it said but not wonderfully – best to check web sites etc and make your own choices. We booked over 6 months beforehand and still couldn’t get our first choice dates. The bookings are “Gorilla Group” specific and we booked for different groups on each day to increase our chances of seeing at least 1. Bwindi is a relatively full day’s drive from Kampala. We had tents and camped at the Buhoma site just outside the park. This also has some rondavels and, run by the locals, provides a means of getting some money into the local economy. Although the tracking permits state that a %age of monies from the $360 per permit (Yes really!!) goes to local development our impression was that most of it probably buys more Mercedes for ministers and government officials! As the web site indicates you can try to get “no shows” – on our 2 days only 1 place was available out of 24 (there were only 2 habituated Gorilla groups then). If you stay for several days and only have a permit for 1 you can go walking in the park on the other days but still need to pay a daily entrance fee and for a guide to accompany you. Chimpanzees are viewable in the park. If you admit to a cold or bad stomach upset the park rangers can stop you entering in order to protect the Gorillas – obviously bad attacks of either will soon be spotted on the trail! Our impression was that the permit system was being regulated properly and that the corruption which one might have expected to have infected such a procedure was not present – don’t turn up with a wedge of $$ hoping to persuade a poor ranger to let you in! As it happened we were lucky on both days. The first group took 3 hours of tracking (The rangers usually know the finishing/sleeping location of each group from the previous day and start the new day’s tracking from there.). The second group was hanging around near to villagers’ fields and only took 30 minutes easy walking to reach. Not much time is given to “seeing” the forest and its other attractions. The Ugandans have branded Bwindi as “The Impenetrable Forest” – how impenetrable will depend on where the gorillas take you. There was quite a lot of climbing in muddy areas and the total walk on the first day was some 7 hours return so you need to be reasonably fit. We found Gabon MUCH harder (and hotter/more humid). You will only be allowed to stay with the gorillas for 1 hour and are not allowed to approach too close – if they move towards you then you must move back (though they may rush at you in mock charge before you can do so!). Don’t expect a “David Attenbrough” experience with them touching you and staring you and your camera in the eye. Nevertheless we got pretty good views and a chance to see the families interacting and generally “doing their thing”. All in all a worthwhile experience and one we hope 1 day to repeat! Pygmy Peoples: "The area was declared an animal sanctuary in 1964, when Batwa were pressurized to leave, and gazetted as national park in 1991, when Batwa communities were finally forcibly expelled along with other neighbouring communities involved in agriculture and other forms of forest exploitation"
High entrance fees: 600 US dollar (1 day gorilla permit, 2017) (in the low season April, May and November you may pay $450). Unusual Entry Requirements or Restrictions: Visitors to the Gorillas have to state that they are not suffering from a cold or stomach upset. If they admit before they leave they get their entrance money back but, if discovered along the way, they have to return to base without recompense!